We all know that our non-verbal communication makes up a large proportion of the messages we send out and those which people receive. There are many numbers thrown around and studies show numbers above 80 per cent for the non-verbal portion of communication. An increasing volume of modern research and several other quotes on leadership and psychology clarify just how much influence our unconscious brain has on our conscious activity. Again, there is a good deal of research which shows that our brain has reached a decision long before our conscious and rational mind believes it decides. “You cannot not communicate” – this is one of the so-called “presuppositions” of Neuro-Linguistic Programming (NLP). Think about it. Maybe you’ve even read some other quotes on leadership or communication about it. If you say nothing, you are communicating; if you say something, are you communicating only what you say or are you communicating other things in parallel? Exactly what are you communicating and how does it match your intentions? Have you checked? As a leader, you will be watched more than most by those you lead. 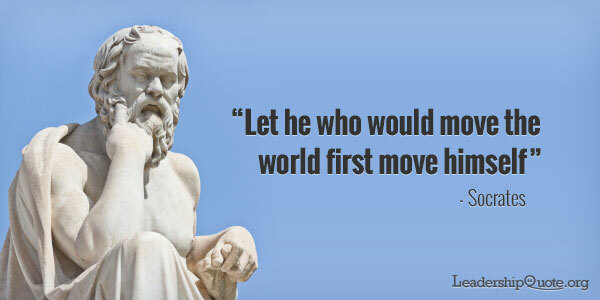 Give a good deal of thought to what you say and do. People will receive affirmations, contradictions and all manner of communications from you whether you mean to transmit them or not. Be consistent with your vision and values as you go about your day. 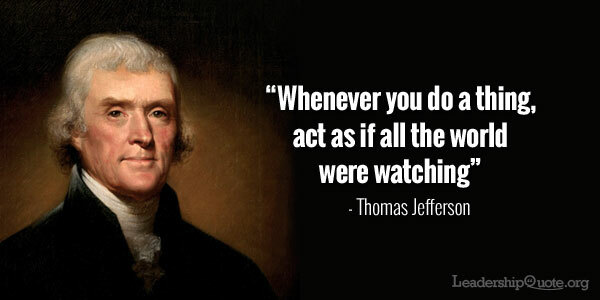 As Thomas Jefferson said, “Act as if all the world were watching”. I agree with Peter Drucker. As he says, “It is the recipient who communicates.” The message is received on the recipient’s terms and the terms must be based on experience. Remember, if you try to communicate things which people don’t expect or have not experienced, they will not receive that communication – and you will not have communicated. Please don’t blame them. Adjust your transmissions so that they are tuned in to receive. Support them in this and you will achieve far more through others. Now is a good time to take stock of how you communicate, how well you communicate, what you want to communicate and how this all fits in with your vision and your leadership. Sit back for a few minutes and reflect on your listening skills. Listen with your eyes as well as your ears. Watch for non-verbal clues. Become an observer. Avoid becoming “one who speaks and listens to himself speak”. Listen with an open mind, gather all the incoming information, both verbal and non-verbal and be careful not to ignore things you don’t wish to hear. Don’t make assumptions or jump to conclusions. The punchline usually comes at the end! This takes practice and skill. Unlike many things, we are born with a great listening skill but it is very easy to lose it as we grow up. To put a different twist on one of the best quotes on leadership from Benjamin Disraeli: you must follow what people say. Are you not their leader? 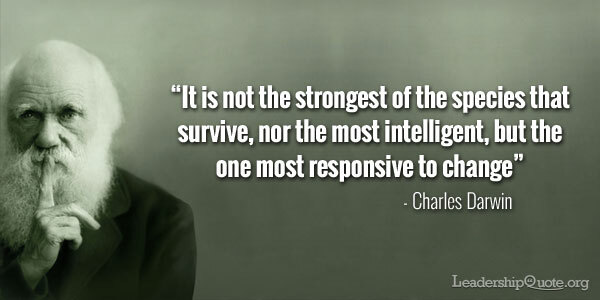 Are You Strong, Intelligent or Responsive to Change? This statement by Charles Darwin, in the context of his theory of natural selection and the Origin of Species, can also cause you and me to think also about the survival and development of organisations and businesses. Will it be different in five years? As a young salesman working in the automotive industry in the early 1980s, I remember sitting outside the office of the Purchasing Manager of Vauxhall Motors, a branch of General Motors in Luton, England. On the glass wall of his office was the statement “If you are still doing things today in the same way that you were doing them five years ago, then you are doing them the wrong way”. My goodness, five years! Nowadays, I would say one year. Vauxhall Motors are still making cars in England – although not in Luton. But my goodness, it was close, like it was for a lot of other firms in the last few years. 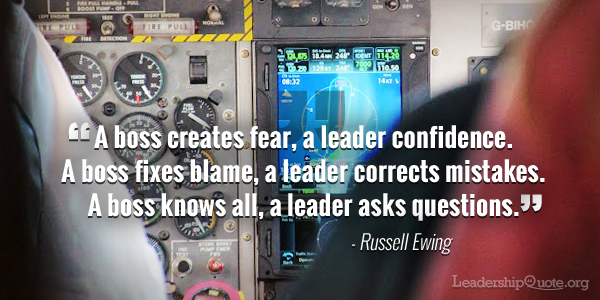 And that’s why this famous leadership quote reminded me of this story. Consider manufacturing. Have you looked at additive manufacturing? If you make things, how will this affect what you do? Many people will soon have a printer in their homes which can produce solid objects from plastic powder. If you don’t make things, how will additive manufacturing affect what you and your customers do? Consider social media. Are you using the social media to interact with your customers and your prospective customers? I am continually amazed by my customers who are not using any of the opportunities to grow. “We’ve tried that and it didn’t work” is a common statement. Well it’s working for many businesses in all sectors. It’s not going away and one thing is for sure – it will all be different in one year from now. Not in five! We need to get used to it. Let’s think about the strongest industries and we will soon bring to mind those which were strong and did not survive. Take a look at what happened to the Swiss watch companies as the quartz movement arrived. Many survived and they are now in a completely different form and place from their original very strong position. An intelligent organisation could also be considered a clever one. Arthur Andersen was one of the “big five” accounting companies. It was certainly intelligent and clever – but it’s not here any more in any form similar to it’s previous strength. Which companies are responsive to change? There are many and they are the ones which are still here. It is not fashionable to quote IBM as successful – but take a look at their history. Many and sometimes huge changes in their business model – who would have thought they would even survive in the late 90s as Microsoft had dominated the PC software market? The way IBM re-invented itself is well worth a read. Start by Googling them and reading the Wikipedia article on them. You know that I often urge you to take stock in the light of the thoughts of a great leader from the past. It’s worth you and I sitting back and looking at our processes, our ways of working. We must keep a close eye on the way things are now, not the way things were 5 years ago. We need to make sure we are operating in the way which works for our customers in this current whirlpool environment. As one of my heroes, W Edwards Deming said in one of his most famous leadership quotes, “It is not necessary to change. Survival is not mandatory”. Can You Discover Ability in Others? Imagine that you have provided a special set of lockers at the entrance to your business. They are special because they are each equipped with a brain life support system. Imagine the lockers are placed near to where everyone passes as they enter your premises. Each time one of your colleagues, your workforce, arrives, they have a hinged lid on top of their heads and they are able to lift out their brains and put them into the locker for safe keeping on life support idle while the owner’s body is at ‘work’. The brain can then be collected on departure at the end of the day. Do you have any people in your business who are acting like that? I first discovered this phenomenon whilst running a factory making injection moulded plastic parts for cars. 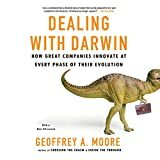 It was in the early 80s, well before my introduction to the enlightened ways of W Edwards Deming and well before the availability of modern computers. One of our best machine operators, Ian, was running a big injection moulding machine, producing handbrake parts. We had some urgent quality issues and needed to start gathering and analysing some dimensional data. The quality manager and I had some challenges with resources. We were searching round for someone we thought could handle the sums for the data analysis. Phone calls were made, requests to other business units, etc, but there wasn’t an obvious answer. It wasn’t a long job for each moulding but the machine produced 60 parts an hour, about 450 a day. Not only did we need the analysis in a timely fashion but the backlog of a day’s worth of data each day would soon become a mountain to climb. If thought you’d never ask! Well, I didn’t know. Neither had I thought of asking whether he could do the data crunching. I went straight over to his machine as soon as the meeting was finished. “I thought you’d never ask!”, he said. Of course, he could do the data crunching. For the football club he was organising the fixture list, and running the bar including ordering the stock and all the book-keeping. We quickly went through what was needed and Ian said it would be no problem to run it within the cycle time of the machine. The data was crunched, the analysis completed and the results were used in our efforts to minimise the quality issues. With hindsight, it’s an obvious error on my part to miss asking the operator to be more involved. You can imagine that I was much more aware of abilities and capabilities as I moved through my career. 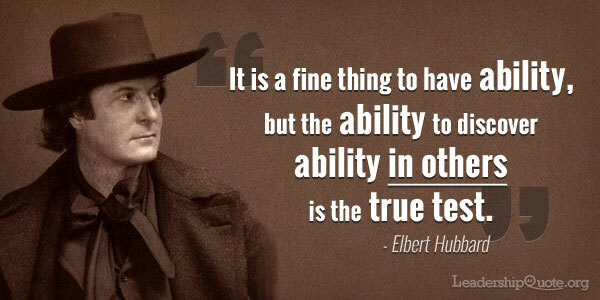 And I believe this is exactly what Elbert Hubbard meant in this great leadership quote. How good are we at making sure we spot abilities, skills and knowledge in our colleagues? Are we encouraging the use of brain lockers or do we make sure the brains are fully in use all day every day? How do we make sure? Being aware is a big step forward. If you enjoyed reading this post and would like more inspiration, my FREE Quote of the Week newsletter delivers weekly insights and inspiration and famous leadership quotes to your inbox – simply fill in your details below.